I am addicted to watermelon right now!! I crave it for 9 months out of the year and thoroughly enjoy it for 3 months out of the year…I LOVE summer if for no other reason than Watermelon!! Is it a fruit or a Vegetable? BOTH!! It’s related to the Pumpkin and Cucumber but of course is a Melon, a fruit, grown like a vegetable. Is Watermelon Nutritious? ABSOLUTELY!! It is definitely recommended to be part of a healthy diet!! Packed full of Lycopene, watermelon is a Lycopene leader!! Yayyyy I knew I loved it for a good reason. It also has Vitamins A, C and B6. A two cup serving is also a great source of Potassium. 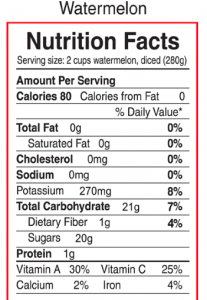 Watermelon is also low in or free of Fat, Cholesterol and Sodium. So eat it, drink it, take it with you, freeze it, blend it, puree it, disguise it in salads, smoothies or desserts, but enjoy it while it lasts!! Watermelon is definitely one of those fruits that is only good while it’s in season. One cup of diced watermelon is 92% water. Great for hydration and really good as juice. You can puree it and run it through a sieve or I love to drink to it as a smoothie!! It is great with some ice, vanilla fat free yogurt, coconut water and Strawberry Shakeology!! LOVE IT!!! In a small saucepan over medium high heat, add 1/2 cup watermelon pulp, sugar, lavender and salt. Bring to a slow boil, then simmer for 5 minutes. Remove from heat and cover for 10 minutes. Place strainer over a large bowl and pour syrup mixture through, straining out lavender flowers. Add remaining 4 cups watermelon, lemon juice and vodka. Stir until blended. Pour into container, cover, place in freezer. When semi-solid, mash up sorbet with fork and freeze again. When frozen, place sorbet mixture into a blender or food processor and process until smooth. 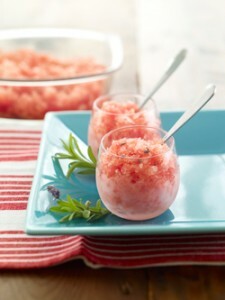 Scoop desired amount into a small bowl or parfait dish, garnish with a small wedge of watermelon and a lavender sprig. So… I’m off to cut up my watermelon, try this recipe and even create a new one … I’ll let you know how it turns out! !